Sometimes it seems like all the good ideas for photography have been used up, doesn't it? This is especially true of maternity photography, where moms tend to be posed in the same way, standing in the same location, wearing the same wardrobe as the next mom. 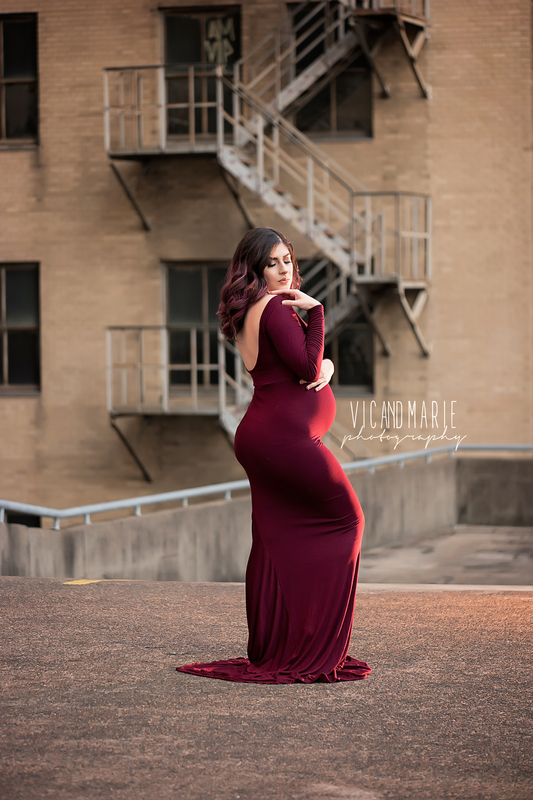 To help you achieve a more unique look, try one of the following maternity photography tips. Given the right model, the right setting, and the right maternity gown, you can mix and match colors and textures to get a detail-rich image like the one above. Just scan the image and your eye is tantalized with textures in the foliage and the rock wall. These textures contrast nicely with the smooth, flowing gown the model is wearing, creating visual tension that makes the shot more interesting to view. There's also a ton of vibrant colors, which would normally be a no-no, but in this case, it works gorgeously. The light and dark greens and reds of the plants on the left act as a good balance to the calm, cool blue of the model's gown. If you want to mix and match, this is how to do it! Another unique maternity photography idea is to take the indoors out to combine the homey feel of an indoor shoot with the natural light and beauty of an outdoor shoot. One way to do this is shown above - just take a nice, comfy chair outside, frame up the shot, and voila, you've got a unique maternity photo. The key here is to select indoor pieces that have a large enough scale that they won't get drowned out by the surroundings. In the case of a chair, something with a lot of detail and structure is a good idea. If you're more ambitious, use a chaise lounge or even a bed as an indoor-outdoor prop. However you do it, the indoor-outdoor look will get you a casual, yet elegant photo that'll be sure to catch the viewer's eye. If you have an adventurous mom on your hands, you might try to take a more rugged maternity photo than what one normally sees. In the image above, you get a sense of adventure as mom poses in the middle of the desert. Even if this particular spot is right next to a highway turnout, it still has that in-the-middle-of-nowhere flair. Something else that helps make this a unique shot is the wardrobe the model is wearing. The deep blue color of the gown immediately draws the attention of the eye while the softer tones and textures of the floral crown and sash work well with the natural theme of the photo. But notice how there's a mix and match going on as well - the colors of the desert are muted while the gown is quite bold. Combined with the interesting scenery, it's a recipe for a more compelling shot. 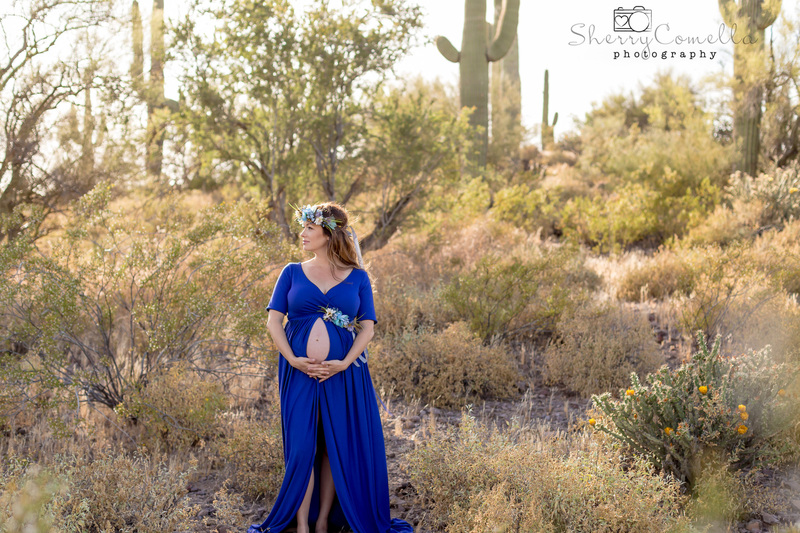 If your client isn't prepared for a jaunt out to the wilderness, the urban jungle provides ample opportunities to create unique maternity photos. When you think about maternity, you probably think of femininity and delicateness. Those features juxtapose nicely in an urban environment that tends to be much harsher. In the example above, the strong lines of the fire escape in the background give this shot plenty of structure and an interesting backdrop on which to highlight mom. 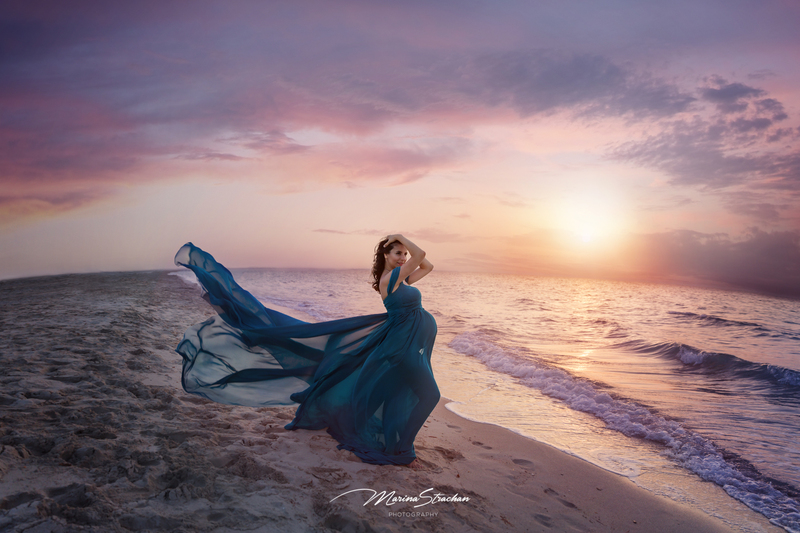 Speaking of highlighting, notice how the soft, Golden Hour lighting helps illuminate the model while her form-fitting gown also adds a softness to the image. Again, this is another prime example of mixing and matching features to get a shot that's sure to draw lots of attention! A final look to consider if you want a more unique maternity photo is to add movement like what you see in the image above. When adding movement, less is more. After all, you don't want mom's gown to end up flying all over the place. In this case, the subtle movement of the gown gives the image a feeling of being more dynamic, almost like a three-dimensional experience rather than just a two-dimensional photo. What's more, when mom is dressed in a gorgeous gown, it doesn't hurt to show it off a little bit by adding wind. 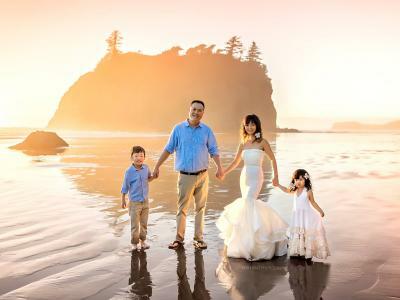 In some cases, nature might be all you need to add movement to the gown, but if it's a still day, have an assistant off-camera to move the gown's train or if you have a fan with power nearby, that can work wonders too! With that, you've got five unique maternity photography ideas to think about for your next shoot. Try one or try them all - I'm willing to bet you'll like the results!